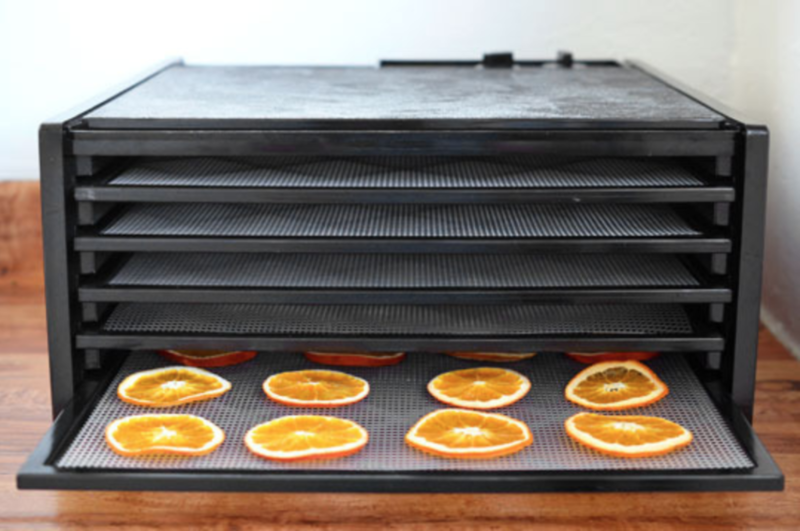 Whether you’re just dipping your toes into the proverbial pool of dehydrating, or you’re a seasoned vet, you’ve made a great choice to be considering the Electric Excalibur Dehydrator. Excalibur, as you know, was the legendary King Arthur’s trusted sword and just like it did him, the Excalibur will protect you and serve you in battle against.. hydration and food spoilage..
We’ve had our Excalibur for about three months now, and honestly, we love it! Note that the picture above is actually the smaller, 5 tray model which is a great choice, but we actually have written up this review about the 9-tray model. included what we love most and what we didn’t quite love (no product is perfect) so you can make the right choice, unlike Merlin’s Beard. 9 Trays fits a TON of food (15 square feet) – enough for 12lbs of bananas, two full heads of kale.. you get the point. The sheets that you actually lay the food on are flexible and bendable, yet durable which prevents food from sticking. The timer is a great function. There’s nothing worse than missing that sweet spot and overdoing certain foods. The timer runs from 2 hours all the way to 26 hours which should more than do it for almost anything you’re dehydrating. Set it, and forget it. 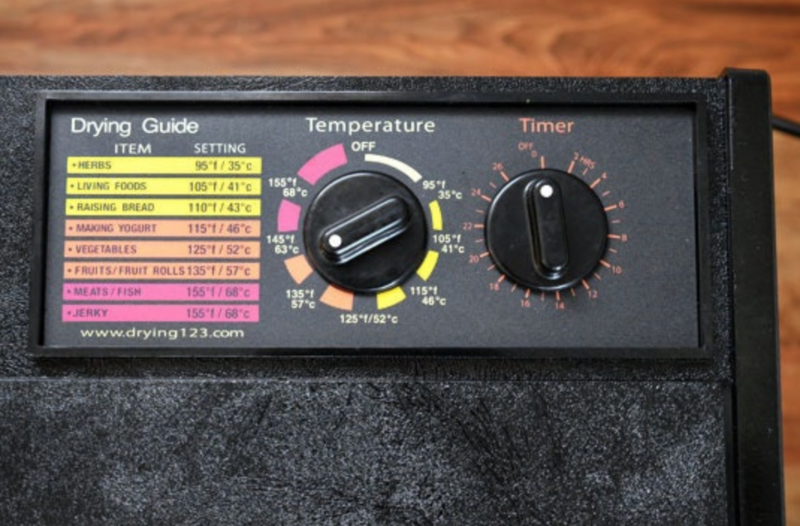 Adjustable temperature settings gives you awesome flexibility in terms of the variety of foods you can dehydrate, and also the timing of your dry. 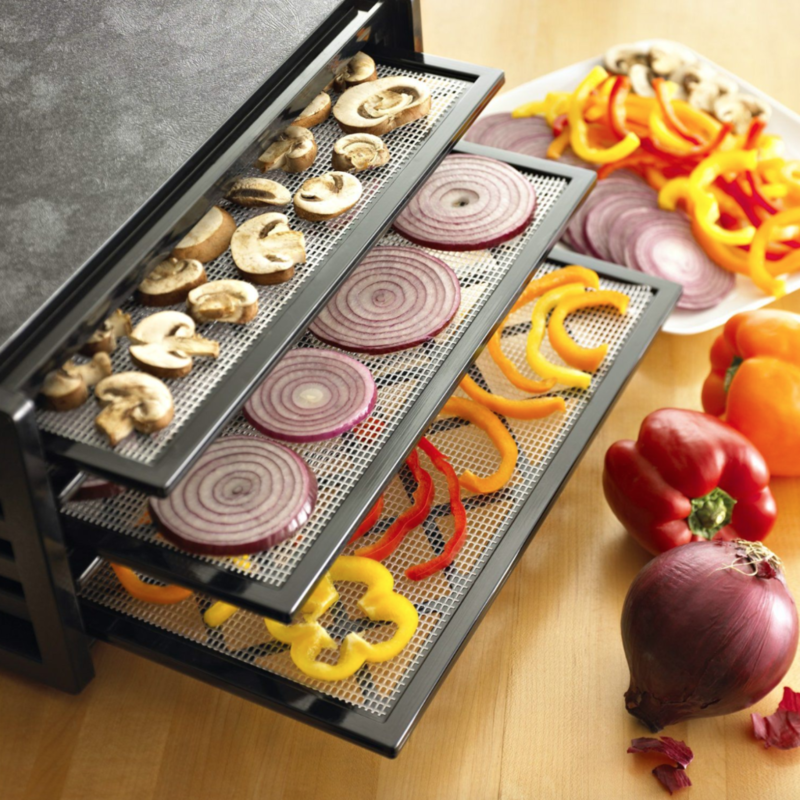 One quick turn of the knob changes from the ideal temperature for veggies and fruits to beef or salmon jerky. The biggest issue with the Excalibur is that it is quite loud. Despite being the cream of the crop of dehydrators, it seems they’ve adopted the old adage of “don’t fix what ain’t broke” and haven’t bothered updating the motor in this thing to a quieter model. It’s not THAT loud, but we weren’t too excited about having it running in the kitchen. We put it on a piece of plywood with a towel between the wood and counter to reduce the vibrations and ended up running it in the dining room which is a room we don’t use very often. The only other issue we had with it was the spacing of the racks. Having 9 racks is great, but they’re only spaced 3/4″ away from each other. So, with certain foods, specifically kale, broccoli and cauliflower which are “taller” it can be difficult to use with all 9 trays. Depending on the size/height of your pre-dried kale chunks or other veggies, as you load your next tray, they may get knocked around by that tray and lose their nice even distribution, (until they are dried). We never had a problem with sliced goods like apples, peaches, or meats for jerky, thoough. The key to keeping your Excalibur running optimally for (hopefully) years is regular cleaning. 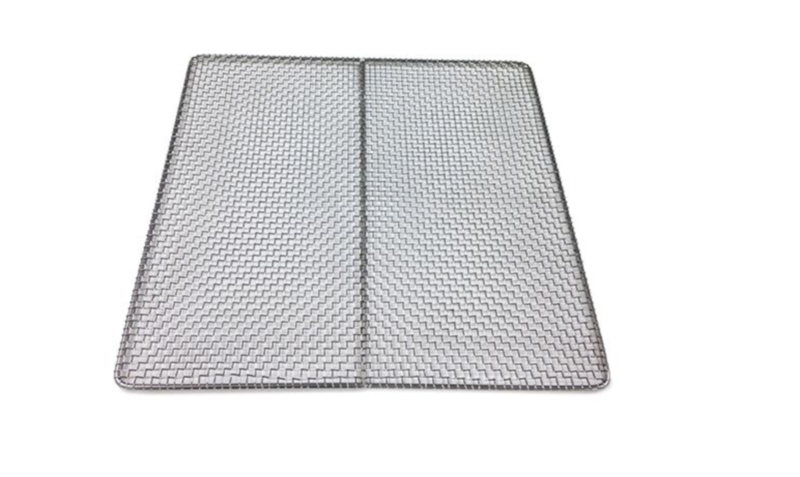 Try and clean the trays after every use and give the inside a wipe down and you won’t get frustrated with the stuck on mess the next time you use it. Take the 5 minutes to do it and save yourself the trouble of replacing it down the road. If there’s lots of stuck on gunk, soak your trays for 30 minutes (or longer) in the sink in some soapy water (if they fit) or in a Rubbermaid bin or tub before scrubbing them clean. The other thing we’d recommend is marking a few trays with some a marker, tape or even just a quick engraving with a pocket knife to distinguish some trays for use with veggies and some for use with meats. This is especially important if you are going to be using pretty strong flavours like liquid smoke, ginger, garlic and soy sauce in your recipes, even a very thorough cleaning may leave residual smells or flavours that can leech into your fruits and veggies. We just engraved a little V on five of the trays and an M in the corner of the other 4 trays using a knife to distinguish and make smaller batches so we don’t have that problem anymore. The other option is to just buy some extra inserts. If you can, we suggest rotating the trays 180 degrees at the halfway mark of the drying process. We find you just get a more consistent final product and a more even dehydration between pieces. It can be hard to find the Excalibur stocked in stores at times because they are so popular. We also find the best prices for these are from online merchants, since you avoid the retail markup. We got ours from Amazon which is a great place to start. If you are a nitty gritty, detail-oriented kind of buyer (like us), then we’ve taken the time to expand on the review above, just for you. Here’s how we came to the conclusions we set out above. Over three months, we’ve tried a lot of different recipes. Some have worked, some haven’t. A few of the things that we find work really well in the Excalibur are: kale chips, green bean bites, apples, pears and most other fruits. We LOVE making beef jerky and have also tried this same recipe with thinly sliced pork and it turned out pretty well! Salmon je rky is another one of our favourites, but you want to make sure you get fresh fish and make this one in a well-ventilated space or the smell is going to stick around. On that note, if you use any strong flavours in your marinades for jerky such as liquid smoke, ginger, garlic and soy sauce, you’ll really smell it in whatever room you’re dehydrating. Consider setting it up in the garage with a cracked window or on the stove with the range hood running for these kind of foods. We tried a couple “sun” dried tomato recipes from pinterest that just didn’t work out at all, but you may have better luck. The last thing we’d recommend is to rotate the trays 180 degrees halfway through the drying process just to ensure you’re getting a nice even dehydration. One of the best things about the Excalibur is the vast flexibility you are granted with both temperature and time settings. The dual knobs allow you to control both of these to perfectly hone your device for both a specific recipe, and your personal tastes. Temperature settings vary from 90F – which is perfect not only for your herbs like rosemary, oregano and mint, but also more crafty things like flowers or leaves – to 155F which is the temperature you’ll want to be using for your jerky’s and other meat products. When the timer runs up the machine automatically shuts itself off which is great since you don’t risk over-drying your favourite foods. We’ve never made anything using the 26 hour timer, but if you wanted to go low and slow, that’d be the way to do it. Most of what we made fell within the 2-10 hour mark. The racks of the Excalibur are durable and slightly bendy, which makes them easy to clean. They’re BPA free plastic so you don’t have to worry about heating the plastic. The plastic trays that that sit on top of the racks are also flexible, and fairly easy to scrub down. But, stuff can really get stuck on there, and we found that flavours like ginger, garlic soy and liquid smoke will soak into the plastic over time. cleaning them is easy, but we suggest giving them a soak in some warm, soapy water before scrubbing them down. To avoid this problem, you could mark some trays with a marker or tape to distinguish some trays for use for meats, and some for just fruits and veggies. Or, you can upgrade to the stainless steel trays and avoid this issue all together. 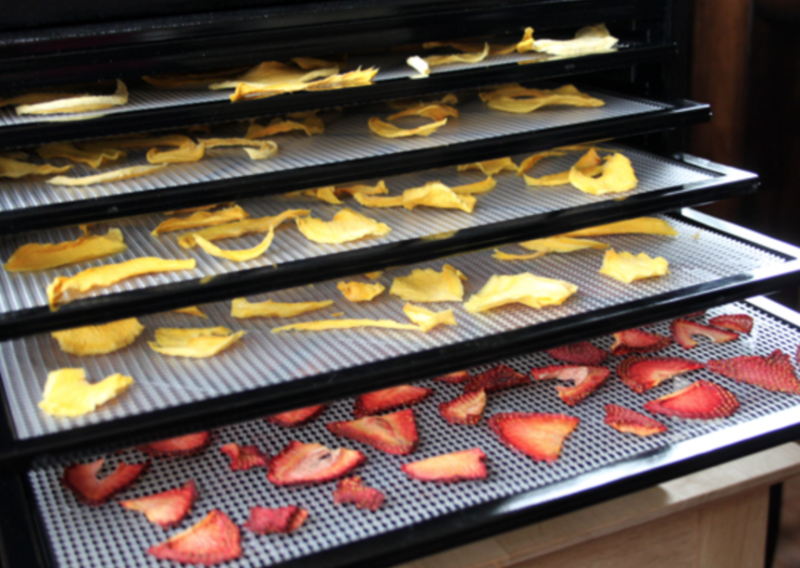 It’s a great investment if you’re going to be doing lots of dehydrating. One slightly annoying thing about the trays: the 3/4″ spacing is a little tight for certain foods. Most notably, cauliflower and kale. Because these two veggies are “taller” than other sliced foods, when you insert a tray above the one you just loaded up, it can sometimes “grab” some of the pieces and cause them to roll, ruining your even distribution. Because you have 9 trays of space, you can omit every other tray, but that’s not ideal for larger batches. Consider pressing down the kale or just using smaller pieces if you find this issue. It’s really not a deal breaker, just something to troubleshoot on your own if these solutions don’t work for you. It can be hard to tell from the pictures, but the Excalibur is a actually pretty large. It’s actually 17″ x 19″ x 12″ so it’s going to take up a good chunk of space on your counter, or wherever you store it when not in use. 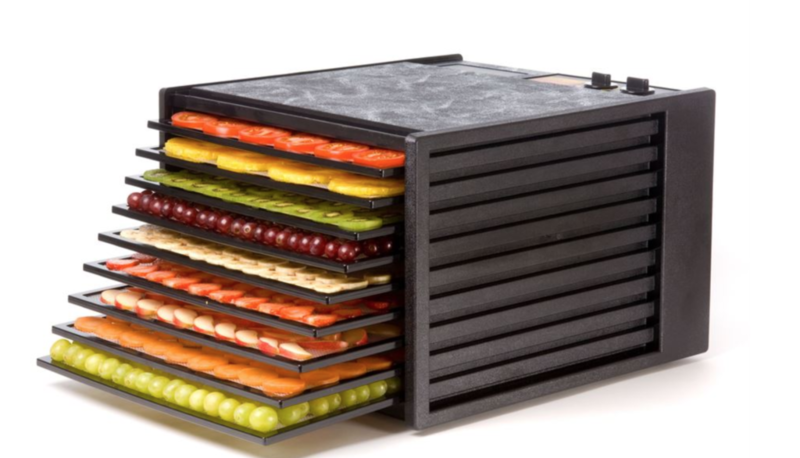 We love the 9 tray model, since you get SO much space to load food (15 square feet of space!) but there is also a 5-tray model that some folks may want consider. While the footprint is the same, t’s also only 8″ high as opposed to 12″ which makes it slightly easier to find space for. Besides the rack spacing for certain foods, the only issue we have with this device is the noise that it produces. It isn’t THAT bad, but we think you’ll find yourself moving it from the kitchen to a lesser used room like a spare room or even the garage. Because it plugs into a standard outlet you really can move it anywhere. The vibrations can also be a bit annoying in certain homes. If you find the vibrations are significant in your space, try laying down a towel or bath mat down on the surface, with a piece of plywood between the towel and the dehydrator. Avoid the temptation to wrap the machine in a towel and always make sure the vents are clear so the air circulation system can function properly! Don’t want to put the motor and internal components into undo stress. 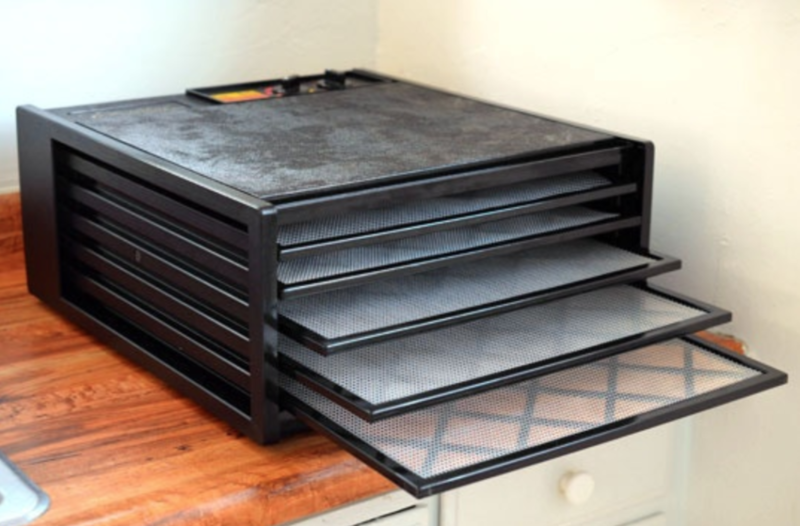 The Excalibur is definitely not the cheapest dehydrator out there, but it’s undoubtedly the best. While you might be paying a few extra bucks for the Excalibur over some other cheaper options, you’re getting a durable, reliable product that is going to last you years (so long as you take care of it properly). We’ve seen these at a few stores but typically see the best prices online. The first place we check prices for most of our purchases is Amazon so that might be a good place for you to start.